Vegas hasn’t been a ratings hit for CBS. Will Golden Boy preform better or will it be cancelled after one season, like so many others TV shows? We’ll have to wait and see. 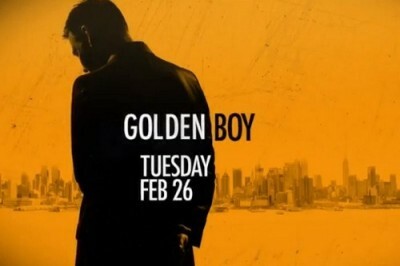 Golden Boy revolves around an ambitious young cop who goes on to become New York’s youngest police commissioner. The show typically airs on Tuesday or Friday nights on CBS. The cast includes Theo James, Chi McBride, Kevin Alejandro, Bonnie Somerville, Holt McCallany, and Stella Maeve. Below are the TV show’s ratings for the 2012-13 season, the best way to tell if Golden Boy will be cancelled or renewed for season two. Final season averages: 1.4 rating in the 18-49 demographic with 8.19 million total viewers. 1.2 in the demo (0% change) with 6.91 million (-1% change). Season averages: 1.42 in the demo with 8.19 million. UPDATE: CBS has cancelled Golden Boy after one season of 13 episodes. 1.2 in the demo (-8% change) with 6.99 million (-9% change). Season averages: 1.43 in the demo with 8.30 million. 1.3 in the demo (-7% change) with 7.64 million (-4% change). Season averages: 1.45 in the demo with 8.42 million. 1.4 in the demo (-7% change) with 7.94 million (-2% change). Season averages: 1.47 in the demo with 8.50 million. 1.5 in the demo (0% change) with 8.07 million (+2% change). Season averages: 1.48 in the demo with 8.56 million. 1.5 in the demo (+15% change) with 7.89 million (+1% change). Season averages: 1.48 in the demo with 8.62 million. 1.3 in the demo (-7% change) with 7.83 million (-3% change). Season averages: 1.47 in the demo with 8.72 million. 1.4 in the demo (-18% change) with 8.07 million (-13% change). Season averages: 1.50 in the demo with 8.87 million. 1.7 in the demo (+13% change) with 9.26 million (+9% change). Season averages: 1.52 in the demo with 9.03 million. 1.5 in the demo (+50% change) with 8.53 million (+15% change). Season averages: 1.48 in the demo with 8.97 million. 1.0 in the demo (-38% change) with 7.41 million (-21% change). Season averages: 1.47 in the demo with 9.12 million. 1.6 in the demo (-11% change) with 9.40 million (-11% change). Season averages: 1.70 in the demo with 9.98 million. Compared to the series premiere of Vegas, CBS was down by 25% in the demo (vs a 2.4 rating) and down by 30% in viewers (vs 14.85 million). Not a good start. What do you think? Do you like the Golden Boy TV series? Do you think it should be cancelled or renewed for a second season? Golden Boy: Cancel or Renew for Season Two? Great series, pity they cancelled it.